Set in Ireland, where it was also shot, the film takes up where other zombie movies tend to down tools. The disease that turns people into flesh-eating mutants has been cured but this only seems to wreak new havoc and spawn further discontent, as the once infected face discrimination and many, on both sides, are unable to come to terms with what has gone before, or simply don't care! 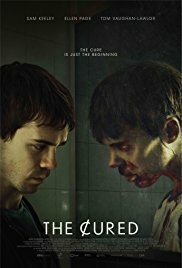 The Cured has already been well received, by audiences and critics alike, winning Best Horror award at Fantastic Fest. It will go on general release this year. See IMDb and Rotten Tomatoes for dates, reviews, etc. George A. Romero, legendary filmmaker, creator of The Living Dead series, was born on this day (4 February), in New York City, in 1940. As this website is dedicated to Romero's filmography and, in particular, to the 'zombie apocalypse' genre that he pioneered, it is only right and appropriate that our journey begins with the man who started it all. Romero's career in motion pictures began in the 1960s, working on TV commercials and short films. Together with a group of friends, who were 'bored with making commercials' and wanting to make a horror/comedy film, capitalising on what they perceived as a 'thirst for the bizarre', they scraped together a budget that resulted in Night of the Living Dead, a film that premiered on 1 October 1968 – making it 50 years old this year. Despite its humble, low-budget origins, the film was enormously successful, both critically and commercially. For Romero, it spawned five sequels, each exploring themes of human behaviour and quest for survival in a context of large-scale social breakdown. It is this theme, rather than any plot, character, story or device that establishes the continuity within each instalment of the series. Other works in Romero's cinematic oeuvre include The Crazies (1973), Martin (1978), Creepshow (1982), Monkey Shines (1988), The Dark Half (1993) and Bruiser (2000) as well as the TV series, Tales from the Darkside, which aired from 1983 to 1988. George A. Romero died on 16 July 2017, "in his sleep following a brief but aggressive battle with lung cancer," according to a statement that was put out. He was aged 77.